Hyperspectral imaging is a powerful technique that combines the advantages of near infrared spectroscopy and imaging technologies. Most hyperspectral imaging studies focus on qualitative analysis, but there is growing interest in using such technique for the quantitative analysis of agro-food products in order to use them as universal tools. The overall objective of this study was to compare the performance of a hyperspectral imaging instrument with a classical near infrared instrument for predicting chemical composition. The determination of the protein content of wheat flour was selected as example. 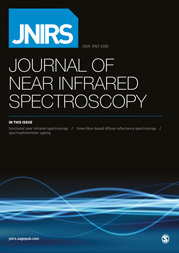 Spectra acquisition was made in individual sealed cells using two classical near infrared instruments (NIR-DS and NIR-Perstop) and a near infrared hyperspectral line-scan camera (NIR-HSI). In the latter, they were also acquired in open cells in order to study the possibility of accelerating the measurement process. Calibration models were developed using partial least squares for the full wavelength range of each individual instrument and for the common range between instruments (1120–2424 nm). The partial least squares models were validated using the “leave-one-out” cross-validation procedure and an independent validation set. The results showed that the NIR-HSI system worked as well as the classical near infrared spectrometers when a common wavelength range was used, with an r2 of 0.99 for all instruments and Root Mean Square Error in Prediction (RMSEP) values of 0.15% for NIR-HSI and NIR-DS and 0.16% for NIR-Perstop. The high residual predictive deviation values obtained (8.08 for NIR-DS, 7.92 for NIR-HSI, and 7.56 for NIR-Perstop) demonstrate the precision of the models built. In addition, the prediction performance with open cells was almost identical to that obtained with sealed cells.